Fall and mason jars go together like apples and pie, pumpkin and spice, peanut butter and jelly. I can’t begin to decorate for fall without a mason jar or 2 (or 10). 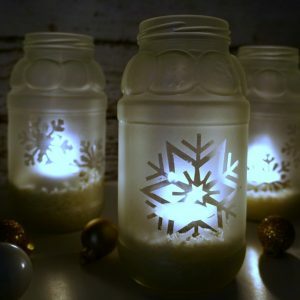 Today I am kicking off a monthly mason jar challenge where I will bring you a new themed mason jar post each month along with projects from some very crafty and talented bloggers. You can see all of this month’s projects at the end of this post. 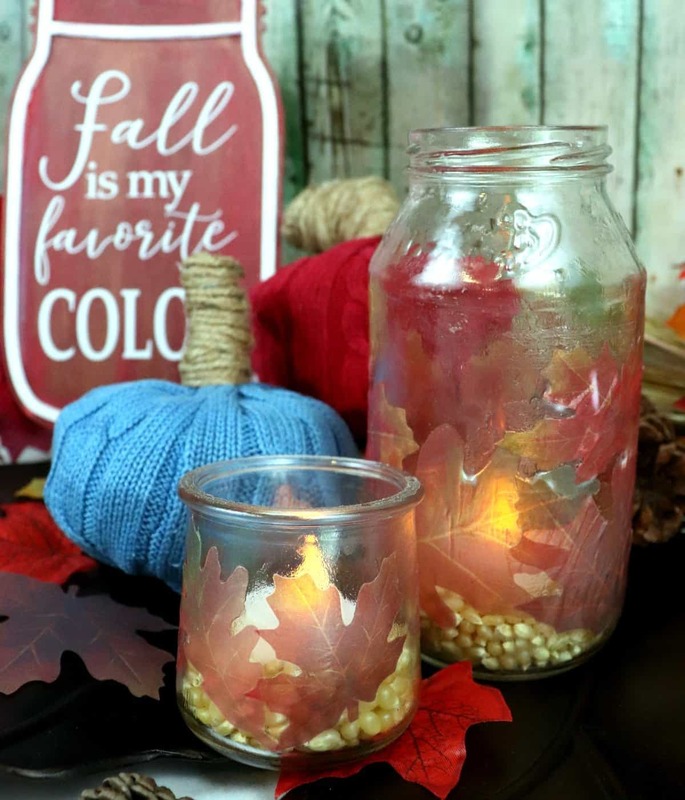 I am sharing a simple fall leaf mason jar that I am using as a luminary. I can’t wait to get these on my mantle this fall. 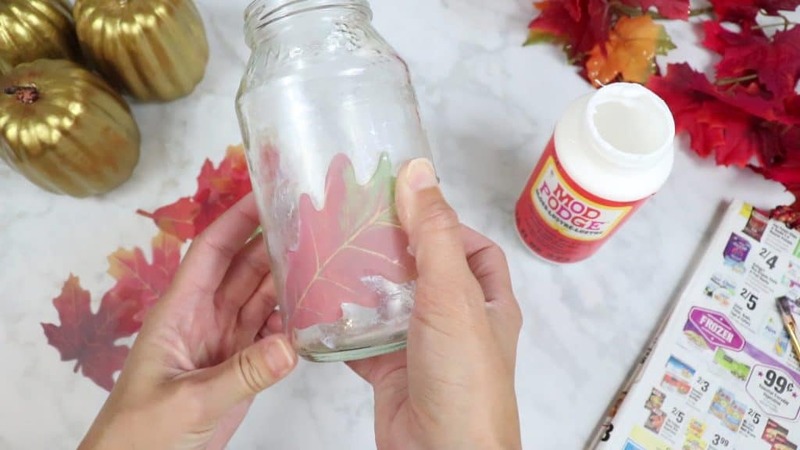 Start by painting a thin coat of Mod Podge onto a clean glass jar. Then paint a thin coat of Mod Podge onto one side of a paper leaf. 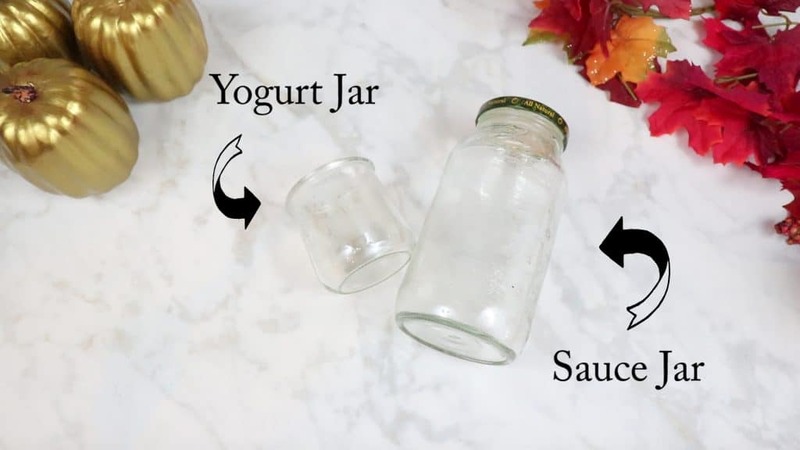 Press the leaf onto the jar, smooth out any lumps, and repeat until the jar is covered. You can overlap the leaves or leave space between, whatever suits your fancy. Once the jar is covered with leaves, let it dry. It does not have to dry completely but the Mod Podge shouldn’t be wet to the touch. Then go over the entire jar with a thin layer of Mod Podge to seal in your work. Let that dry fully and you will be left with a clear glass jar and leaves that are sealed in place. 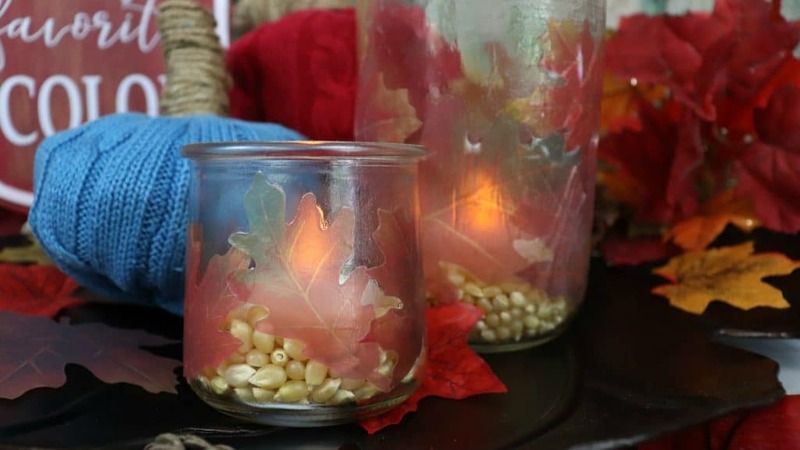 Add seeds, beans or stones to hold a tea light and you have a fall leaf mason jar luminary. Now check out these inspiring fall mason jar projects from a few of my friends. Be sure to pin this image! What a great idea to decoupage! so pretty! Pinning! These look so elegant! The paper leaf has just the right amount of sheerness (is that a word) for a luminary! This will look great on your mantel. I love that you used upcycled jars! These are so cute they are making me ready for fall! This is right up my ally! It reminds me of the way it looks almost like stained glass. I bet is is really gorgeous at night with those flickering candles! Love these fall mason jars! I need to make a few for my dining room table. Wow! These are really pretty and would be so pretty with the tealights. I love that you only put the leaves on the lower half of the jar so the light will still shine through a lot. Very creative. I love the snowflake ones too. I had to click over and check them out too!